Mouse is one of the most identifiable computer peripheral for both PC and Mac. It is a pointing device that functions by detecting and a 2D motion relative with the supporting device. The first pointing device can be traced to Xerox Alto. Microsoft and Apple both introduced this pointing device or mouse in the early 1980s. After the initial days mouse have undergone a sea of development as well as changes. Jewellers and designers have also been fascinated by this computer peripheral and designed and developed some of the most astonishing designs and the expensive mice. Here are some of the top few. Made by Logitech, the Logitech Air 3D laser mouse is priced at 24,180 USD. The mouse is covered by using a gold case. The mouse also features a jewel micro flash drive, and also a diamond ring. Definitely one of the costliest mice in the world, the Logitech Air 3D laser mouse in the gold case can surely take your breath away with its exquisite looks. The mouse is priced at 26,730 USD, and made from 18 carat white gold. It is also set with 59 diamonds which are brilliantly cut. The characteristic colour is due to Rhodonisation, and the gold is also added with palladium alloy. Available in two designs of scattered diamond and diamond flower, the mouse can also be personalised by adding initials or also coloured trims. The MJ Blue Sapphire Mouse is one of the most expensive mouse in the world. The Blue Sapphire Mouse is priced at 27,940 USD. Encased in a gold frame, the mouse is sleek in design and as the name suggests, it is decorated with blue sapphire completely. The MJ Blue Sapphire mouse is definitely worth every penny of its price. This is another very creative and expensive mouse from the house of computer peripheral manufacturer Logitech. As the name is self explanatory, the mouse is studded with pure black diamonds. The mouse is priced at a eye popping 31,840 USD. Definitely one of the collector’s item for both jewellery enthusiasts as well as technology enthusiasts alike. The mouse is made using white Austrian strass along with diamonds studded beautifully across the body. The mouse is priced at 34,480 USD. The name suggests that the mouse looks more like a gold bullion or a gold brick. It is the costliest mouse in the world and priced at 36,835 USD. The mouse has both right and left buttons as well as a scroll wheel. It is compatible with both PC and Mac also. 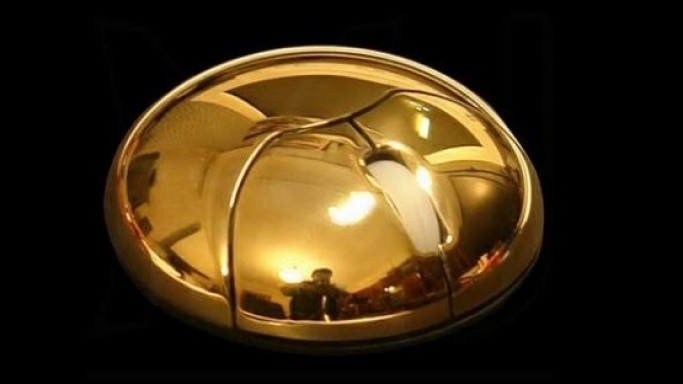 Finally: There are some other mouse that are pretty expensive by normal standards are a Gold metal sun mouse that is priced at 19,720 USD, and is shaped as a circular disc of pure gold. Crocodile skin gold mouse Ferrari priced at 17,258 USD is made from 18K gold and diamonds of blue colour. A Python leather mouse is made from gold finger plates and genuine Python leather. It is priced at 17,840 USD. Another premium leather bound mouse decorated with expensive crystals is priced at 18,510 USD. Known as the Gigabyte bling-bling GM-M7800S, it is also a wireless mouse. With touch screen and touch sensitive screens and operating systems developing fast and gaining more popularity, mouse can be a thing of the past really soon. With laptops and other smaller versions also using touch panels for pointing and selecting functions, the nice feel under the palm and clicking noises may soon be replaced by other technology.